I am an artist. I am not bragging or anything, I actually went to art college, and have spent the past 20-ish years in the field of design and advertising. In one of my art history classes back in college, I remember being told that Michelangelo once said: “Every block of stone has a statue inside it and it is the task of the sculptor to discover it.” I know what he meant. I felt exactly the same about the 5″x5″x9″ block of mozzarella cheese on my kitchen counter, just waiting for me to carve it for our first M4P. I am of course no Michelangelo! But it was still pretty successful. As far as Star Wars fan art is concerned, it definitely turned out pretty cheesy…which of course was the whole point. 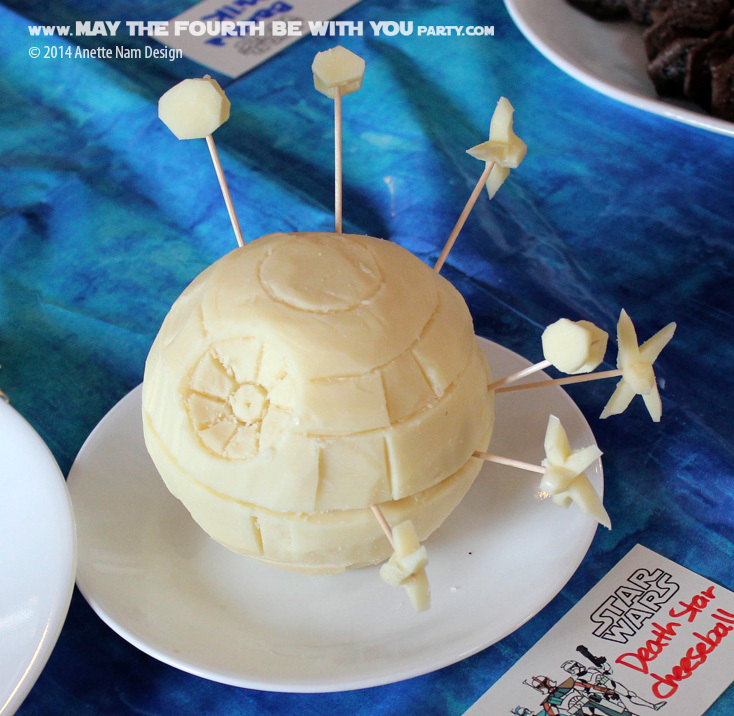 Our very first excursion into the world of Star Wars cheese art. Lots of Mozzarella Cheese. Most cheeses at the deli counter (not specialty cheese counter!) are in large rectangles. So you will need however large a cube you can get (usually 4-5″)+ another 2-3 inches for the ships. Start by cutting as large a cube as you can get out of your block o’ cheese. Round the corners gradually, and cut away until you have a ball. I found that a potato peeler worked REALLY well for this. Once you are happy with the sphere, start cutting the trench, and the markings of the Death Star. Attach the ships in formation. There are other cheeses you can try – just stay away from anything that crumbles (like most Parmesans). You are using A LOT of cheese, so better keeping it cheap. I ended up accentuating the markings by “drawing” with the end of a Korean chopstick. A toothpick or an awl or knife will not work. It needs to have a more blunt/square edge, otherwise the cheese will “seal” right back up. I am thinking a tiny flathead screwdriver will do the trick too. ..and if you decide carving cheese is not for you, you can always mold it in silicone molds instead: Check out our R2-D2 cheese and the Tosche-ese Station. ← Cutest Yoda Ever, She Was!